We’d love your help. Let us know what’s wrong with this preview of The Recruit by Addison Albright. Phillip Brewer has weeks to live—if he lets his disease run its course. Albert Manlii has walked this earth for more than two thousand years, but survival on his own was never easy. Now he leads a faction of highly organized vampires who carefully guard the secret of their existence. Unlike the old days, potential recruits are carefully selected and presented with an offer. To ask other readers questions about The Recruit, please sign up. The Recruit is a short story and therefore I did not expect the character arc I prefer in novels, but Albright still provides her readers with solid personality profiles of her protagonists. Albert does not display the cruelty that is so often associated with fictional vampires; he is loyal to his faction and his kindness and pragmatism make him a good leader. Despite the fact that Albert can feel the potential of a blood mate bond when he first sees Phillip, he A Joyfully Jay review. Phillip Brewer has terminal cancer. Considering his youth, that death sentence is shocking and depressing so he spends his good days walking around and enjoying the sights Mother Nature provides, knowing his time for joy is limited. When he meets Albert Manlii, a good-looking older man, he’s immediately attracted at first, and then he’s intrigued by the bizarre proposal Albert makes. Albert is offering him eternal life if Phillip chooses to join his organization. That organization is made up of Phillip Brewer has terminal cancer. Considering his youth, that death sentence is shocking and depressing so he spends his good days walking around and enjoying the sights Mother Nature provides, knowing his time for joy is limited. When he meets Albert Manlii, a good-looking older man, he’s immediately attracted at first, and then he’s intrigued by the bizarre proposal Albert makes. Albert is offering him eternal life if Phillip chooses to join his organization. That organization is made up of vampires and its sole purpose seems to be to keep them functioning as a society without coming to the attention of humans. Intriguing? Yes. But he must agree immediately and then the conversion will be done as soon as he agrees. So saying yes and diving in with both feet, he’s suddenly a part of this vast organization and he’s most definitely in the midst of a romance that he’s unprepared for. It seems Albert is his soulmate and that couldn’t make Phillip happier. The story had so much potential but the action and execution was choppy. It’s as if the author wanted to cover everything and made an outline of key points. Then she filled in those points but not enough and somewhere along the way there’s a disconnect. Scenes don’t feel complete. New situations aren’t fully explored. The romance is fast, definitely insta-love, though that’s somewhat normal for a soulmate situation. But even the scenes of the two together are sketchy at best. Every scene seems rushed. It would likely have been so much better if it was much more fully developed. But on the whole, I liked this story and I definitely liked the concept. Unfortunately, the execution keeps me from going any higher than 3 stars. 3.5 Stars That was refreshing original. I loved the way this was build. Phillip is walking one of his last walks... halfway a handsome man looks at him in a very special way... in any other case he would have give it a shot... but... he is walking one of his last walks. When Albert sees the man walking he knows that he is special and he approaches him. Albert is a more than two thousand years old vampire and head of an faction of vampires, 3.5 Stars That was refreshing original. I loved the way this was build. Albert is a more than two thousand years old vampire and head of an faction of vampires, it’s an impressive organization. It’s a sweet read with a lot of affection, nothing specific on paper, still I loved it how this was thought-out. Smoothly written story with great environments. For me the feelings could be more palpable put down, it was sweet but I would have loved some depth. Otherwise I enjoyed this short one with a promise of more! I was given a free copy of this book to read and review for Wicked Reads. This is pretty much a paint by numbers vampire story. The author strings together tired genre tropes without adding anything terribly original or memorable. Albert and Phillip both have the potential to be fantastic characters but both are underwritten. Phillip’s cancer storyline should pack an emotional punch, but readers don’t really get to engage with his emotions. Instead, the story is mostly narrated from Albert’s pra I was given a free copy of this book to read and review for Wicked Reads. A sweet, cozy vampire romance with just a touch of menace about it to spice things up. Phillip Bower is a dying man, trying to resign himself to his fate when a very attractive vampire makes him an offer he can’t refuse. A chance to live as someone else, as a vampire in a tight community of vampires like himself. Besides, Albert, the immortal gentleman whom makes Phillip this offer, is renewing his desire to live, emphasis on desire. There’s something comforting about this story, the way Phillip A sweet, cozy vampire romance with just a touch of menace about it to spice things up. Phillip Bower is a dying man, trying to resign himself to his fate when a very attractive vampire makes him an offer he can’t refuse. A chance to live as someone else, as a vampire in a tight community of vampires like himself. Besides, Albert, the immortal gentleman whom makes Phillip this offer, is renewing his desire to live, emphasis on desire. There’s something comforting about this story, the way Phillip is eased into his existence as Neil the vampire and renewed by it. A few terrifying jolts keep the tension up, but Phillip/Neil charmed me with open-minded, philosophical perspective about what was happening to him, how he reacted to the startling changes taking places. Albert, his mentor and lover makes an intriguing contrast to him in his suave, assertive directness, with an occasional hint of a ruthlessness which doesn’t go hand in hand with a disregard for life, mingled with his growing protectiveness and affection for Neil. For all of these qualities, I give this four stars. The world building in this story is very detailed and well thought out. I loved how the author took the vampire mythos and gave it a unique spin, yet addressed that mythology with feasible explanations rather than dismissing it as ‘just a myth.’ Vampire society is very well organised, almost like a military operation, and they cover their tracks very well. These vampires are ‘progressive, organised, and diverse.’ I liked the details that made this world come to life. For example one of the chara The world building in this story is very detailed and well thought out. I loved how the author took the vampire mythos and gave it a unique spin, yet addressed that mythology with feasible explanations rather than dismissing it as ‘just a myth.’ Vampire society is very well organised, almost like a military operation, and they cover their tracks very well. These vampires are ‘progressive, organised, and diverse.’ I liked the details that made this world come to life. For example one of the characters becomes a vampire and his vision becomes blurry because he’s wearing contact lens and no longer needs them. I also liked how the change itself wasn’t a big drama and quite straightforward and how the story focused on adjusting to being a productive member of vampire society. The characters are interesting, and I liked the hints of Albert’s history during his long life through dialogue with his friends rather than a big info dump. I found Phillip easier to connect with as he struggles with his new identity as Neil, and tries to put his old life behind him. I thought his reaction to his disease and the offer he’s given was realistic. Albert felt a little detached and stoic, but I figure given how long he has lived, it’s a demeanour which is understandable. The supporting cast came across as three dimensional, and I enjoyed their interaction with the main characters. The Recruit is an enjoyable story, and I hope we haven’t seen the last of this world as I’d love to read more about it. I’d recommend The Recruit to readers who enjoy urban fantasy and stories about vampires that give a unique spin on the mythology. Addison Albright is a new-to-me author. The Recruit is the first in The Faction series. The Recruit was a super fast, not too deep novella that I read in under and hour. At the start, Albert shows how the Faction goes about recruiting new vampires, where they must be of a specific age and look to fill a role needed in the group, as they cycle their identities and professions. Choosing Phillip, who is dying of terminal cancer, Albert feels a spark. The whole of the novella is Phillip's transformation into Neil, and I don't mean the transition from human to vampire, as that took less than a second and less than a sentence. which was anticlimactic in the extreme. Neil's diction, clothing, and profession as a delivery man. The world-building is quick and simple, not explained or shown. The romance is instant fated mates. Blood Mates. Yet a blood mate is not explained, nor does anything have to happen metaphysically to tie them together. The romance is just accepted from the start, no hot and steamy on the pages. I need to add that there isn't even any fade-to-black action. It's nonexistent in the romance, intimacy, and physical. The author tells us it exists a sentence here or there thrown in, but there is nothing shown whatsoever on the pages. Most important to me was some sort of emotional intimacy, but then again, Neil and Albert don't show any emotions. To be quite frank, while this was a quick read, with no editing issues, and was easy to follow and fall into the story, there wasn't much depth to capture my attention. It felt like a checklist of things, which meant the emotions were missing. For a short book, this had a solid story. The vampire world and rules that were developed was awesome. Albert is the head of a vampire faction. They prefer to avoid harming humans, and deliberately search for people to come to their ranks as new recruits. Phillip is dying of advanced cancer and only has a week or two to live. He is approached by Albert to join their ranks, and decides to take him up on his offer. There was a mention of Phillip being Albert's blood-mate, but I felt like this could For a short book, this had a solid story. The vampire world and rules that were developed was awesome. Albert is the head of a vampire faction. They prefer to avoid harming humans, and deliberately search for people to come to their ranks as new recruits. Phillip is dying of advanced cancer and only has a week or two to live. He is approached by Albert to join their ranks, and decides to take him up on his offer. There was a mention of Phillip being Albert's blood-mate, but I felt like this could have been explored a bit more. Phillip didn't even know that he was moving to a future with Albert, so it could've been written a little clearer for the reader (and Phillip) to believe it. This was the only thing I felt could've used clarification, though. Overall, this was a great story for so little pages. The line between life and death can be very thin when the decision is in the hands of a creature seeking for new recruits to serve its purpose. Albert is leading an organized group of vampires who are carefully looking for new people to join them. Filling their profile for the perfect recruit isn't a simple task, but with a disease making him count his days on earth, Phillip has come to consider their offer and is trying to conquer the expectations they had set for him. It was very interesting to The line between life and death can be very thin when the decision is in the hands of a creature seeking for new recruits to serve its purpose. Albert is leading an organized group of vampires who are carefully looking for new people to join them. Filling their profile for the perfect recruit isn't a simple task, but with a disease making him count his days on earth, Phillip has come to consider their offer and is trying to conquer the expectations they had set for him. It was very interesting to see the how and why the vampires choose certain persons to join them. I loved seeing the way they worked and getting to know the rules they create for themselves. I loved the interactions between all of them. It was an easy book to read, enjoyable and with a nice and steady pace. It had a more contemporary feeling than paranormal, even considering it was a book about vampires, but there was something about the way they handle themselves that just felt that way. The plot was fine but I did feel like it could have accomplished so much more for such an interesting concept. I didn't think it was very romantic and that was one of the few issue I had with it. The relationship between Albert and Phillip just didn't felt right. I find it hard to connect emotions with them and to care for them as a couple. They didn't have great chemistry and, in general, their relationship felt a little forced. I ended up more interested on how the world worked for them than to see them evolve as a couple. It was an enjoyable book. I had a good time with it and overall liked it. It could be enjoyable for M/M readers who like paranormal elements. This was a decent short story. It takes place in modern time but with some paranormal vampires added into the mix. This book is a short story but it is pretty much a full story that was well written. Phillip is facing his immortality each passing day. Though he has accepted the fact that he does not have much time left on earth due to having incurable cancer, he still wishes that things could have ended differently for him. But knowing he has such little time left on earth and that each day is go This was a decent short story. It takes place in modern time but with some paranormal vampires added into the mix. This book is a short story but it is pretty much a full story that was well written. Phillip is facing his immortality each passing day. Though he has accepted the fact that he does not have much time left on earth due to having incurable cancer, he still wishes that things could have ended differently for him. But knowing he has such little time left on earth and that each day is going to be worse then the last, he has made his mind up on how his life will end..... on his terms not cancers. Albert is the head of his coven of vampires. Vamps are not like what they used to be when he was first turned thousands of years ago. Now things are different. People are chosen to become vampires and there is no feeding off of people. That is what blood banks are for. So when they chose to bring someone new into there mix, they chose someone who is terminal, who has no family ties, and someone who chooses to become one of them. When Albert catches the scent of Phillip, he knows that he could be his blood-mate. The only issue is will Phillip choose to believe in the unbelievable and become a vampire or will he refuse and continue on with his own plans? This was a good short story with a decent storyline behind it. I enjoyed this book. Addison Albright did a good job on this book. It was an enjoyable read. Look forward to more by Addison in the future. I've been interested in vampire books/shows/movies since the first one I caught on TV when I was a little girl. They're fascinating creatures and it's always nice to see how different authors have such vastly different takes on them. The Recruit showed us not only a different kind of vampire society, one where all vampires work for a common goal of keeping themselves a secret from others and making themselves self-sustainable without harming humans. The romance is secondary, but it wa 3.75 Stars! The romance is secondary, but it was still lovely to see the connection between Phillip/Neil and Albert. I would've liked the whole blood-mates concept to be explained further, but I hope we'll learn more about it in the next book. Overall, a very interesting, intriguing read. I'm curious as to how Neil's encounter with his ex will impact their lives. 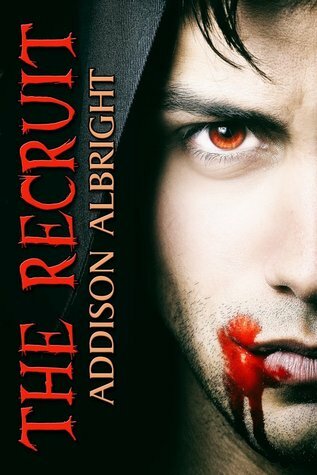 The Recruit by Addison Albright is the first book in the Faction series. A Quick and entertaining read, the world created here sucked me right in and the characters would not let me go. The Vampires recruit new members very selectively, and in this book we get to watch the two main characters meet and watch the beginning of the transition from human to part of the faction. Albert is in charge of helping recruit new vampires in a very special and selective process. He notices Philip who is dying f The Recruit by Addison Albright is the first book in the Faction series. A Quick and entertaining read, the world created here sucked me right in and the characters would not let me go. The Vampires recruit new members very selectively, and in this book we get to watch the two main characters meet and watch the beginning of the transition from human to part of the faction. Albert is in charge of helping recruit new vampires in a very special and selective process. He notices Philip who is dying from cancer and chooses him to join the ranks, especial since he senses he is his blood mate. Given the choice, Philip chooses to join the faction and gets his new identity, Neil. But the transition is not smooth. Albert and Neil's story gets a promising start and definitely made me want to read more about not only them but the faction itself. Romantic, hopeful, creative with incredible world-building. i really enjoyed Neil and Albert and their connection. The author creates a really interesting secret world where Vampires co-exist, however humans don't know about it. I loved the detail and the logic that was the basis for this world-building. The writing is great and the story-line flowed nicely. This is an awesome first book and their is a sequel 'The Choice' that you will want to plan on reading also. i know i couldn't wait to read Romantic, hopeful, creative with incredible world-building. i really enjoyed Neil and Albert and their connection. The author creates a really interesting secret world where Vampires co-exist, however humans don't know about it. I loved the detail and the logic that was the basis for this world-building. The writing is great and the story-line flowed nicely. This is an awesome first book and their is a sequel 'The Choice' that you will want to plan on reading also. i know i couldn't wait to read it. . The Recruit is the most unique take on Vampire fiction I've ever read. It's beautifully written and the world building was as wonderful as it was refreshing. The faction itself felt so credible that I found myself believing in it, which was a delight in itself. Addison Albright is a writer living in the middle of the USA. Her stories are gay romance in contemporary, fantasy, and paranormal genres. She generally adds a subtle touch of humor, a smidgen of drama/angst, and a healthy dose of slice-of-life to her stories. Her education includes a BS in Education with a major in mathematics and a minor in chemistry. Addison loves spending time with her family, Addison Albright is a writer living in the middle of the USA. Her stories are gay romance in contemporary, fantasy, and paranormal genres. She generally adds a subtle touch of humor, a smidgen of drama/angst, and a healthy dose of slice-of-life to her stories. Her education includes a BS in Education with a major in mathematics and a minor in chemistry. Addison loves spending time with her family, reading, popcorn, boating, french fries, “open window weather,” cats, math, and anything chocolate. She loves to read pretty much anything and everything, anytime and anywhere.